Heading back down the motorway towards home, I started hitting the traffic in the usual places around the ever present roadworks. But I didn't really mind to be honest. In fact, a couple of days later, I barely remember the journey back to Herefordshire. You see, I was on my way home from a simply 'Unique' weekend in Runcorn. I was on an astronomy high after a packed weekend of fun, laughter and learning. I had officially popped by NWAF cherry, and boy did it feel good! I had come to hear of the NWAF from my newly found astronomy family during my recent times visiting AstroCamp in the Brecon Beacons. At the time though, I wasn't sure if it was quite for me, but I never could put my finger on why. Skip forwards a couple of months to the end of last year, and a trip out to AstroFarm in Confolens for a week under some inky black french skies. Our hosts for the week were Andrew and Sue, proprietors of AstroFarm, and organisers of the North West Astronomy Festival. During the week, both had spoken about the festival and encouraged me to consider going, even offering some dates that I might want to pencil in the diary with the message 'watch this space'. And so the seed had been sown. Around 9 months later, I turned up at my hotel, a little apprehensive, but soon to join some good friends who had also made their way over for the festival. It was time to relax and enjoy the night before the festival, meet some new people and start looking forward to what would turn out to be something quite special. I had bought my VIP ticket in advance, and this was by way the best way to throw myself into the full experience of NWAF. As well as getting me full admission to the festival itself, it would also grant me access to all the talks and lectures held over the weekend (7 in total), an astronomy show, an Astro Question Time session and on top of all that, entry to the Social Supper on the Saturday night. This was one extremely packed weekend! The festival itself is held at the Heath Business Park in Runcorn, Cheshire. An ideal location with lecture theater, event hall and refectory which would cater for all our needs over the weekend. The doors to the festival opened and it was time to head to the main hall where so many different societies from the the North West and further afield had come to set up stands and stalls. 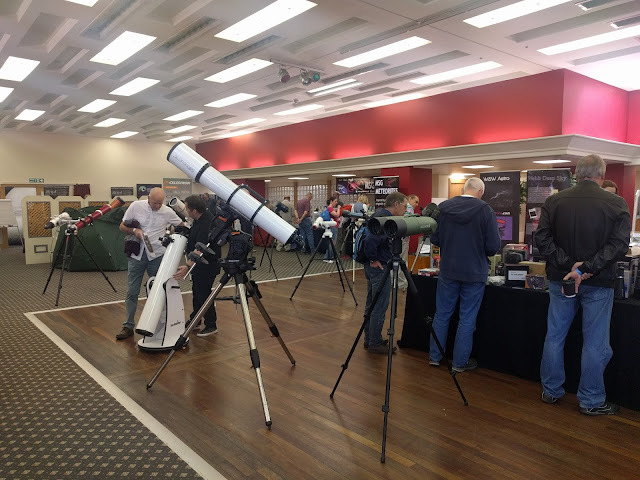 Retail stands from the lovely people at Tring Astronomy were also there, along with Astronomy Now and MSG Meteorites - yes, you could buy your own bit of Mars! The main hall early on the first day. Plenty of equipment to see and buy among many other stands. A big part of the festival for me was the opportunity to attend a whole selection of different talks. The theme for Saturday was Women in Astronomy, and so provided the basis for the day's talks. First up was Jane Green. Many people I know had attended her talks before and had really enjoyed them. Jane's talk, entitled 'Never In A Million Years' tackled the subject of the birth of our Sun, how it compares to other stars in the universe, the birth of stars and the death of stars. The thing I took away from that talk more than anything else was her explanation of the scale of the universe, distances involved between different constellations, and even distances within familiar observable targets. Next talk on the list was from Hillary Harper-Abernethy who chose to continue the days theme of Women in Astronomy by talking about Caroline Herschel. This was particularly interesting, as Caroline is often overshadowed by her brother, William Herschel. Hillary told us of Caroline's journey through life, and her work in astronomy, both with and without her brother. I have visited Bath many times, and walked past the Herschel museum but have never visited it. Next time, I'd like to put that right. In a packed schedule, the next talk was by a leading scientist in the UK, Jane McArthur, whose talk was about meteors and craters on Mars. This was certainly a change of gear and took some concentration to understand. Jane is so passionate about her work and research. That certainly come through in her talk. Her explanations on the formation of craters, and the composition of meteorites depending on the processes that created them were simply amazing. 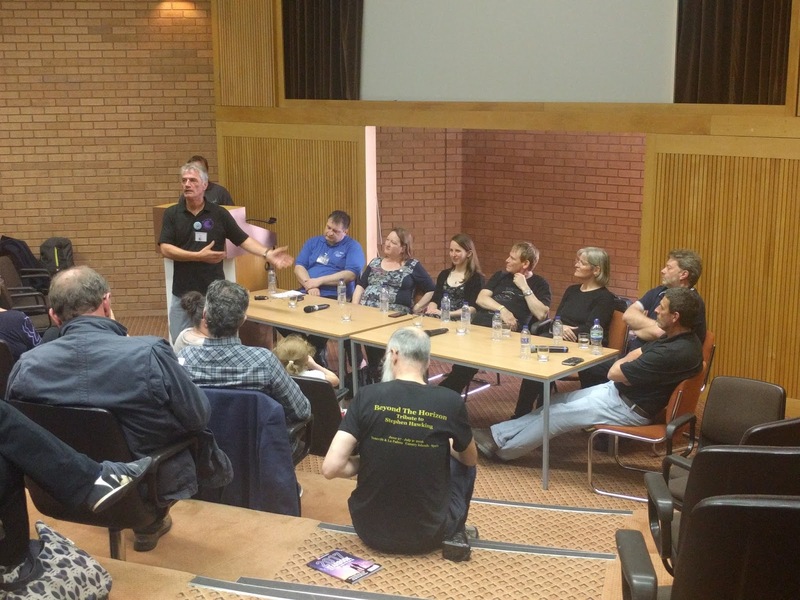 A really nice touch to the next part of the day was a session called Astro Question Time. A panel of all the presenters who had already spoke and were scheduled to speak the following day was put together and it was the audience chance to fire questions at the panel. It was such a good idea and put a great emphasis on getting the festival goers even more involved. The panel for Astro Question Time take their seats. To round the day's talks off, Paul Hill of AstroCamp and Sirius Astronomy fame took to the lecture theater to present his famous science show. A fun, but educational look at what makes a rocket move, what happens if you don't wear a pressure suit in space and what Tim Peake wore under his pressure suit. As you can see, astronomy is an incredibly social hobby. It's not all about standing outside in the cold and dark waiting for a gap in the clouds. Indeed, this was the first astronomy activity I had been to where the weather could do whatever it wanted. VIP ticket holders were invited back to the conference centre in the evening to take part in the Saturday Social Supper. A simple idea and a big get together where people could join up for a few drinks, a good feed, and yet a further chance to meet new people. A simple idea that rounded off the day perfectly which I spent sharing a table with a 78 year old gentlemen who had some tales to tell! I'm embarrassed to say that I can't remember his name, but it was a pleasure to spend time listening to what he had to say. If day 1 was anything to go by, day 2 was going to be another cracker. A check down the list of the talks for day 2 showed that this was going to be a crammed day. Enough time to grab a coffee and chat with people from the night before, and then straight in to the days first talk. The first of 4. 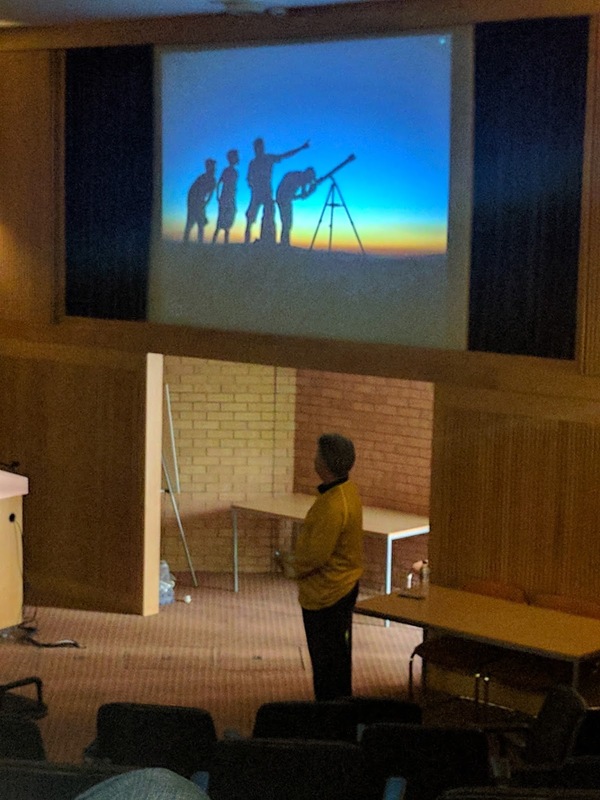 Stuart Atkinson took to the lecture theater floor, complete with gold top star trek outfit to give his talk on Skywatching - The Absolute Beginners Guide. The Honest Version. It was a very funny look at the hobby of astronomy. 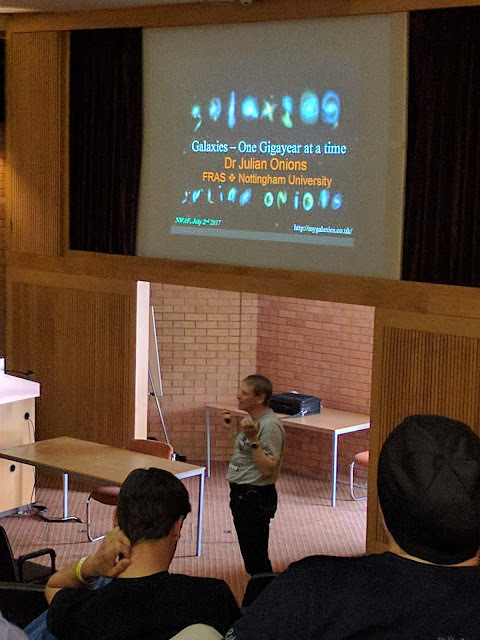 He give plenty of anecdotes about what we, as astronomers, do, but with plenty of home truths in there too. It very rarely happens like this. - Stuart Atkinson presenting. The next talk was one I found particularly interesting and engaging. I had the pleasure of a meeting Gary Palmer for the first time at NWAF, and took the chance to talk with him several times over the course of the weekend. Gary is a world authority on solar imaging and the equipment used in astrophotography. He brought with him several pieces of equipment, new to market which people could get their hands on for the first time. 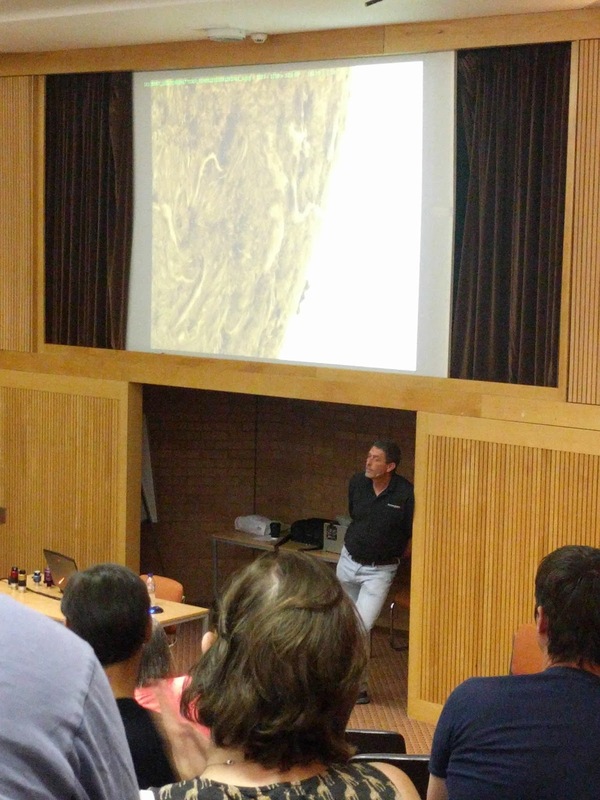 Gary's talk was wonderfully relaxed and unstructured, leaving the audience to fully take part and guide the discussions. Gary's time on the floor flew by. Here is Gary looking very relaxed in front of one of his own solar images. Gary Palmer, solar imager extraordinaire. Half way through the days talks, and with no break in site, it was time for Dr. Julian Onions to take to the lecture theater floor. Julian brought his talk on galaxies called Galaxies - One Gigayear at a time. As amateur astronomers, one of the more pleasing targets to look at in the night sky are galaxies. But they come in a huge variety of different shapes and orientations. Julian talked about the classifications of these galaxies and how, as scientists, they like to make lists and put things in order. There was a bit more to it than that of course. He showed some stunning images of galaxies, including our neighbour, Andromeda. Ever had your name spelled in galaxies? A little more that half way through the day, and we were already on our 4th talk. This talk was on something that I knew nothing about. It was so interesting and was one of those talks that really inspired me to give something different a try. 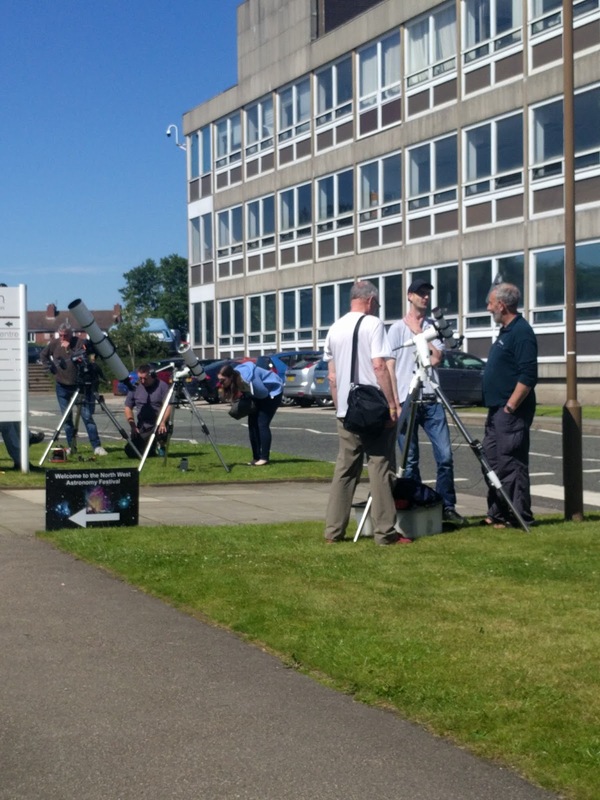 Anthony Jennings came to the festival from the Manchester Astronomical Society and gave us his talk on anaglyphs and 3D photography. As we took our seats, we were given 3D glasses to wear during the talk. He started by inviting people down to the front with their glasses to look at a variety of anaglyphs giving us a taster of what was to come. Using 2 very simple pieces of software, Anthony was able to show us exactly how to create 3D images using nothing more sophisticated that a standard camera. Even, how to make 3D images of the surface of Mars using publicly available 2D images from the internet. 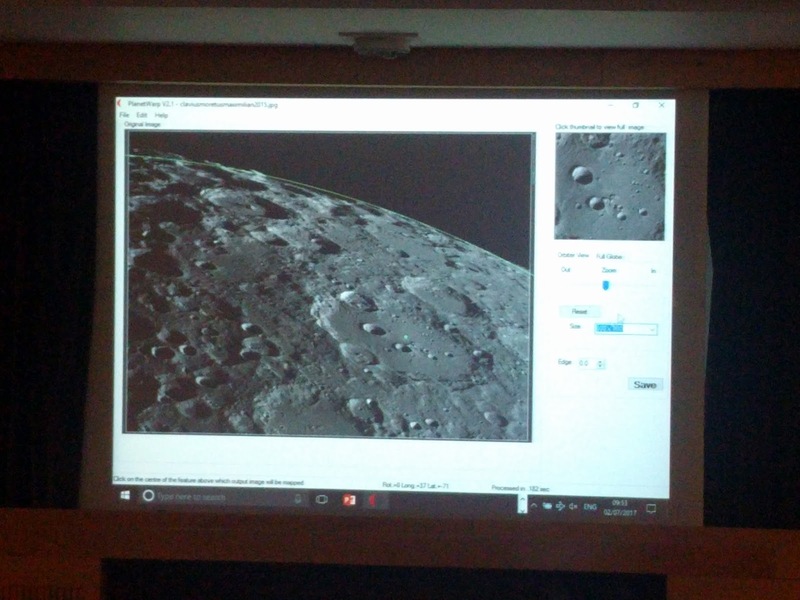 Not only did he show us how to create these images, but also, how to make a 3D rendering of planetary or lunar photographs. Again, an incredible demonstration using a simple piece of software which, when configured would allow you to rotate a picture, and even look down into such things as craters of the moon. Simply stunning, and achievable by anyone. Turning a 2D lunar image into a 3D rendering allowing you to 'look inside' craters. We were fast approaching the end of the day, but not having a break so far, we had a one hour break which gave people chance to go out and take part in some solar observing and get some fresh air. What was in store was a great raffle, incredibly emotional closing remarks and news of NWAF 2018. Available for people to use were a whole range of telescopes and solar scopes brought by members of the various astronomy societies, Tring Astronomy Centre and Gary Palmer. Throughout the festival, everyone was invited to buy raffle tickets which raised funds for the astronomy festival. It must be remembered that the festival is run as a not for profit event with proceeds covering it's own costs, and then being put forward to run outreach events in the Northwest. On offer as prizes were a whole range of goodies from meteorites to mugs and tickets to Solarsphere to a break at AstroFarm. This was my first NWAF, but it was to be the last at the forefront of its organisation for two people. Andrew and Sue Davies. They started the whole festival 5 years ago with the aim of bringing together people from different societies and educational groups for a celebration of an amazing subject. Before the event started, Andrew and Sue announced that this was to be their last festival in their current rolls. AstroFarm which is their residential astronomy business in France, has proved to be incredibly successful and consequently demanding of time. Unfortunately, Sue wasn't present at the festival, having to remain in France and it was left to Andrew to provide the closing remarks. In an incredibly emotional piece, it was obvious that what they were doing was letting go of something they both cared so much about. A closing video of photographs from festivals of the past brought back some powerful memories for Andrew and his team. Even though it was my first time at the festival, watching this was hard. Very hard. And what made things harder was the way in which Andrew made his way around each and every member of the assembled audience to give a personal thank you for their support. This was truly unique. The ovation at the end was testament to the feelings stirred within. The festival ended on a great note with confirmation that NWAF would be back in 2018, albeit with less involvement from Sue and Andrew, allowing a committee of representatives from local societies and other people take over the reigns. Leaving the festival was like leaving the last day of the best ever holiday. But it was a familiar feeling, the same as happens when it's time to leave AstroCamp. It was great to meet up with the ever expanding astro family and great to know that I would be seeing many of them again in only a couple of months time. Now, several days after coming back to Herefordshire, I can look back and reflect on my favorite parts of NWAF 2017. I have brought back so many memories. From seeing Andrew for the first time since our trip out to AstroFarm and being greeted with the biggest man hug possible to attending the first talk of the festival by Jane Green. From meeting and having the privilege of spending time talking to Gary Palmer through to learning about 3D photography. The whole experience has been inspirational, and a complete break from normal run of the mill life. I'm really pleased the festival is going to continue on to its 6th year, and I sincerely hope I will be able to make it again in 2018. Thank you first and foremost to Andrew, Sue and all the rest of the organising team that pulled together to put this event on. Thanks also to Neil and Jane at Tring Astronomy for dangling brand new astro toys in front of me and whetting the appetite for my next purchase. Gavin @pillarscreatio Vicky Bennett and Gary Palmer @Solar_Gaz it was a pleasure to meet you all. Hope to see you again soon in AstroCamp. To the rest of my astro friends for making me feel welcome as usual.